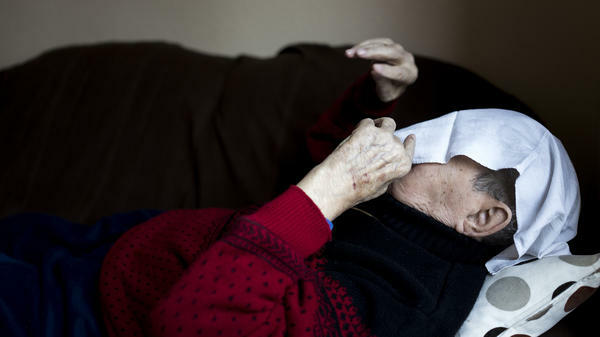 A towel covers the face of a man in a geriatric day care facility of the German Red Cross at Villa Albrecht in Berlin. After Alzheimer's disease, Lewy body dementia is the second-most common form of dementia in the elderly, affecting over 1 million people in the United States. The findings, which haven't been published, were presented Thursday at the annual meeting of the American Academy of Neurology in San Diego. So-called Lewy bodies are clumps of a protein that accumulate in parts of the brain involved in thinking and movement. The condition is marked by cognitive fluctuations, motor deficits, and hallucinations. According to Dr. Melissa Murray, assistant professor at Mayo Clinic in Florida and lead author of the study, Lewy body dementia, or LBD, can be thought of as on a "spectrum ... between Alzheimer's disease and Parkinson's disease." In a retrospective study, Murray and her colleagues examined the medical histories of 75 patients at Mayo Clinic who had been diagnosed with LBD. The diagnoses were confirmed after their deaths by brain autopsy. They found that male patients were five times more likely to have had REM sleep behavior disorder than to have had any of the other core features. A similar trend wasn't found in women. The potential link between acting out dreams and developing dementia is not entirely new. In fact, in 2005, the Dementia with Lewy Bodies Consortium added REM sleep behavior disorder as an additional "suggested feature" of LBD. Although this study didn't include a control group, Murray says it provides evidence that REM sleep behavior disorder should be included as one of the core features of LBD. REM sleep behavior disorder "overwhelmingly increases the risk of developing dementia with Lewy bodies," she says. The reason for this might be because areas in the brainstem involved in sleep are particularly vulnerable to Lewy bodies and begin to accumulate the proteins before other areas of the brain are affected. And we're talking way before. According to Murray, REM sleep behavior disorder can predate the development of dementia by up to 30 years. Of course, not all people who act out their dreams will develop dementia. But Murray says that about half of people with REM sleep behavior disorder appear to later develop LBD. Having a strong early signal for the disease could be useful. "These cases are, in a sense, a perfect example of people who one day may develop dementia but could be targeted early on," explains Murray. Although there is currently no cure for LBD, there are drugs that can relieve some of the symptoms. Also, once a diagnosis of LBD has been made, certain drugs can be avoided, including antipsychotics, which can worsen movement issues and confusion in patients with LBD. And although it might be daunting to learn that you're at risk for developing dementia, Murray says that it's still beneficial to have the information. "You can discuss the options," she says. "That way, people have time to plan."